Sliced bread, fluffy eggs, crisp bacon... all ingredients for a hearty breakfast sandwich. And while it's simple enough to whip one up at home, these eight San Diego restaurants prove that the breakfast sandwich doesn’t have to be boring. From lemon aioli to jalapeño cream cheese, these breakfast spots are giving swift kicks to traditional egg sandwiches. And these sandwiches are so versatile, there’s no need to relegate them to breakfast time; who would be so foolish as to eat breakfast foods only at breakfast anyway? The Ultimate Breakfast Dip is not your typical breakfast sandwich. This delectable concoction needs a fork and a knife but the extra, civil work is well worth it. It’s packed with smoked ham, Muenster cheese, sliced tomato, lemon-thyme aioli, and spinach inside slices of sourdough. A fried egg (over easy) is served on top, since no breakfast sandwich is complete without an egg. And The District’s spicy tomato broth, made with fresh habaneros, soaks into the bread, giving the sandwich a spicy little kick. If loving bacon is wrong, we don’t want to be right. 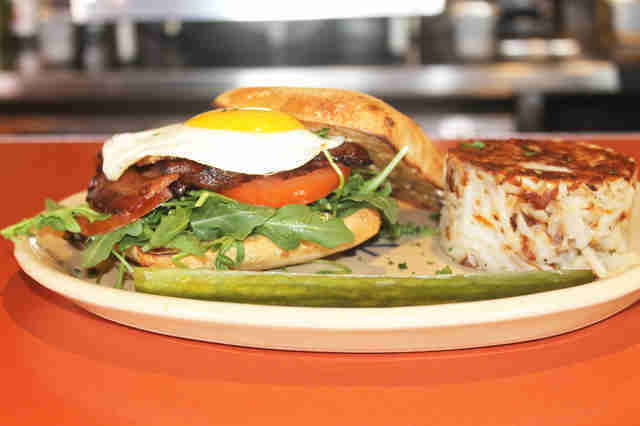 The tender belly bacon on the B.E.A.T sandwich makes Snooze’s breakfast sandwich a standout. Served perfectly crisped atop a cage-free egg prepared to your liking, a bed of arugula, and sliced tomato, the bacon ties the sandwich together. All of the fresh ingredients are served inside toasted ciabatta with a ridiculously tasty bacon aioli, because no breakfast sandwich is complete without some sort of mayo. It comes with a side of Snooze’s delicious hash brown patties, if it can even be classified as such (see that terrine-looking thing above?). Somehow, the chefs managed to update the classic patty so it looks more like a modern side than an afterthought. The Pipes breakfast sandwich made it on this list for its dedication to simplicity -- we'll call it "clean eating." 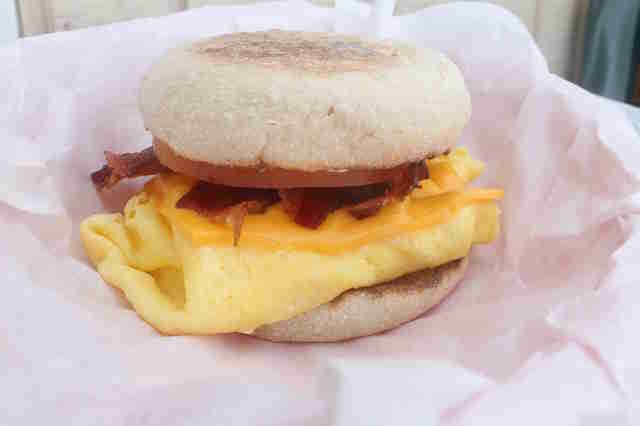 The sandwich comes with the basics: bacon, tomato, mayo, and an egg scramble, all inside an English muffin. 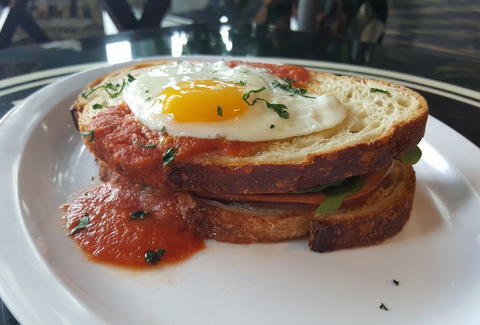 While it's by no means the fanciest breakfast sandwich, it's absolutely satisfying. The breakfast sandwich is smothered in mayo and the freshly cut tomato slice mingles with crisp, hot bacon to create the perfectly sized sandwich that won’t put you in a food coma before 9am. 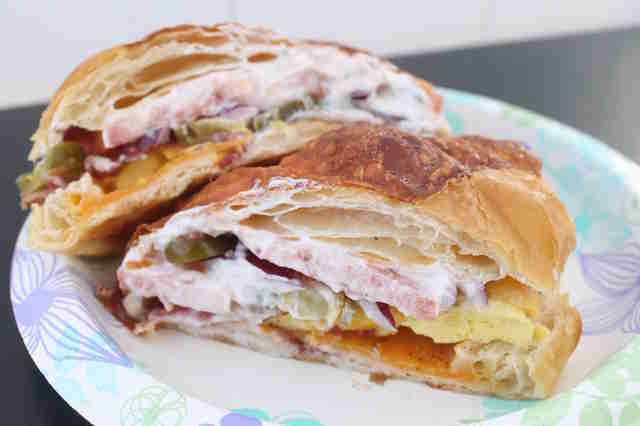 The Vesuvio breakfast sandwich is a Mediterranean twist on the morning staple. 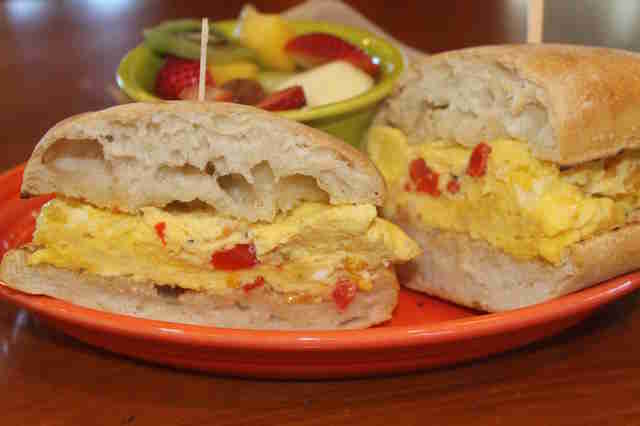 Scrambled eggs are topped with fresh basil, roasted bell peppers, and feta. The eggs-to-toppings ratio is perfection; the feta and bell peppers perfectly harmonize with the fluffy scrambled eggs. It's served with a side of fresh fruit, so you can feel good about the sandwich you just demolished. Krakatoa’s outside patio is the perfect place to start a morning, offering a secluded oasis in the heart of Downtown. Brian's Big Breakfast Sandwich is exactly what it promises. Stacked high on three slices of grilled sourdough, it’s packed with every breakfast fixing you could ever want. 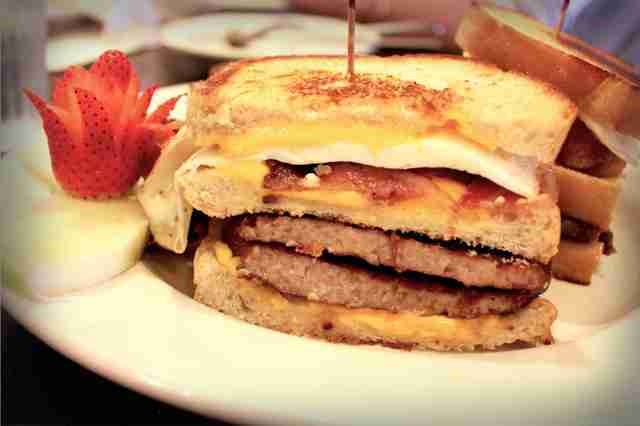 It comes with four slices of melty cheese, two sausage patties, four slices of bacon, and two fried eggs. This could make a delicious morning meal, or since Brian’s 24 is open all hours (if you didn't already guess by the name), a late-night splurge. The newest kid on the restaurant block is The Crack Shack. While it’s getting tons of (well-deserved) fanfare for its fried chicken, it also serves up a mean breakfast sandwich. 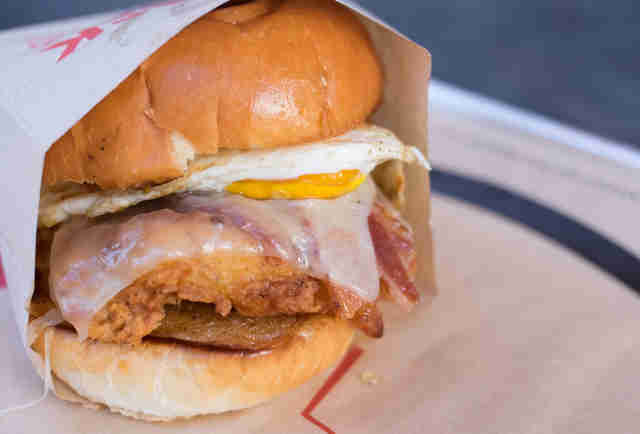 The Señor Croque combines land and... land by topping a crispy chicken filet and fried egg with bacon. It comes with a slice of melted white cheddar and miso-maple butter, which brings the flavors of the pork and chicken together in perfect umami. It’s both sweet and savory, and likely the (solid) reason for the sandwich’s popularity. The restaurant sells between 100 and 150 Señor Croques every day. The star of Breakfast Republic’s breakfast sammie is the specialty bacon, dubbed Jurassic Pork. The thick-cut applewood-smoked bacon is marinated in paprika and brown sugar before being flash baked. The bacon is served underneath a sunny side-up egg, which gets its own peek-a-boo window, framed in sourdough (the best kind of pane, if you ask us). 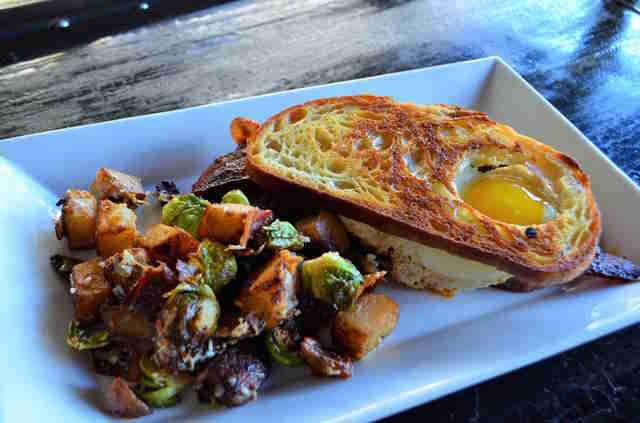 Add a side of Brussels sprouts-laden potatoes and you’ve got yourself a breakfast. Ellen Wright is a freelancer at Thrillist who prays at night for an In-N-Out breakfast sandwich, with lots of Animal sauce. Follow her on Twitter: @PacificPolished.